Named “T-Shirt” after the T-shape in its pattern, it was not until the 1950's that the T-shirt stopped being an undergarment to become an icon. American soldiers started wearing it as civilian clothes after World War II, and also the success in the cinema with actors like Marlon Brando, James Dean or Steve McQueen who made it very popular wearing it in many of Hollywood films. Since then the T-shirt is a symbol of youth and Fashion world has accepted it as a basic garment thanks to its versatility. During its history, the T-shirt has adapted to multiple variations to become a daily garment and full of possibilities, as well as Roly wide catalogue shows you. Founded in 1990, Camisetas Santomera s.l. parent company of the current Roly brand, started its path with the manufacture of garments nationwide and with the personalization of T-shirts through small screen printers. Little by little the company expanded its offer both in colors, since its first t-shirts were exclusively in white, and in types of garments, including in its catalogue polo shirts and fleece. These T-shirts were commercialised under Perro Blanco brand at the beginning, the first brand of the company followed by others that diversified the different qualities and product lines that the firm sold. The whole process was controlled in domestic manufacture, from the purchase of yarn to tailoring, through weaving and dyeing. Although the last one was done by third parties. Currently this integration of the production and control of the whole line make Roly an expert brand in different garments, as well as different types of fabrics, such as piqué fabric, fleece, interlock or single jersey, very used in its production. Despite the fact brands such as Beach Club or Cotton imported T-shirts in the early 1990’s, the company started to import garments in our country from 1996. Firstly through brokers that managed the purchase in origin, and with direct imports under the brand Roly from 1999, created 3 years earlier. Coinciding with this period, the company Gor Factory S.A. was founded to assume responsibility and control of the import process of the garments. In the same way, the company attended the trade show DIPA Valencia for the first time, thus starting a constant presence in the sector trade fairs. 2006 became a key year in the history of the company. The company made the decision to unify its different brands under Roly, starting a new period that extends to the present. 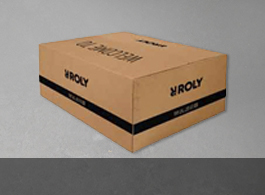 At the same time, all its infrastructures were centralized in a single location, creating the current logistics centre in the province of Murcia and opening several national and international branches from where Roly brings its products closer to the different markets and clients.